All within a short drive from our luxury Cornwall cottages. The complete family day out. Over an acre of outside play areas and over 45,000 sq ft of indoor excitement. Trethorne also offers ten pin bowling and a highly regarded 18 hole golf course and driving range. Cornwall Karting Cornwall’s Premier Kart Circuit! Based just outside Newquay. The only Venue to feature the Award Winning Biz Le Mans Twin Engine Pro Karts. We cater for all age groups, from only 3 years old and up. The otter sanctuary is the only place in West Cornwall breeding the British otter. During your stay you will be able to sample products we provide from the St Kitts Herbery range. If you wish to visit them they are just 10 minutes away from our luxury Cornwall cottages. Launceston (20 minutes from our luxury Cornwall cottages ) Launceston was the county capital until 1838, a walled town with one of the few remaining fortress arches (Southgate Arch) still in existence. A visit to Launceston Castle provides stunning views from the top. The town itself comprises ancient narrow streets surrounding the main town square. Among the many interesting Georgian buildings is Lawrence House in Castle Street – now a museum of local history; a swimming pool, steam railway, riding stables, paintball and golf. Bude (20 minutes) Beautiful beaches. Canal, shops, swimming pool, cinema, golf, car boot sales in the summer, bowling, mountain boarding centre, zorbing, etc. Moorland walks on Rough Tor and Brown Willy and only a 10 minute drive from our luxury Cornwall cottages. Coastal and inland walks are bountiful in North Cornwall. Peaceful walks through the local forestry, Golitha Falls near St Neot on the edge of Bodmin Moor, St Nectan’s Glen (St Nectan’s Kieve a 60ft waterfall and the Holy Well) at Trethevy, Rocky Valley walk to the sea at Trethevy, past the Bronze Age Maze carvings. Golf The cottage is ideally situated to play at many challenging and beautiful golf courses: Trevose, St.Enodoc, Lanhydrock, St.Mellion, Bowood, Trethorne. Cycling on the Camel Trail between Bodmin, Wadebridge and Padstow and cycling on the West Country Way Cycle Route, which passes right through our little hamlet of Trelash and our luxury Cornwall cottages. Camel Cycle Trail (35 minutes) The Camel Trail is a free 18 mile cycle way which runs from Bodmin to Padstow and passes through Wadebridge. You will enjoy some of the most spectacular countryside in the south west. You can take your own bikes with you or hire from Bridge Bike Hire. Crackington Haven (ideal for rock pooling), Bude (Crooklets and Summerleaze), Widemouth Bay, Trebarwith Strand, Polzeath, Daymer Bay. Castles at Launceston and Tintagel. Museums at Lawrence House, Launceston; Bude, Tintagel; Camelford; Davidstow War-Museum; The Shipwreck Museum, Padstow. Ancient monuments Warbstow Bury 5 minutes from Meadowview Cottage (one of the largest hill forts in Cornwall); The Holy Well; Golitha Falls at St Neot; The Hurlers stone circles at Minions on Bodmin Moor; Bronze Age carving at Rocky Valley, Trethevy; King Doniert’s Stone, St Cleer; Trethevy Quoit – Portal Dolmen (The Giant’s House) at St Cleer. Local Fishing Villages Boscastle, Port Isaac (still fishing today and host to TV series Doc Martin), Port Quin, Padstow (still fishing today). 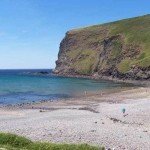 Villages of interest: Closest – Warbstow (The Bury and Norman church) Boscastle, Tintagel, St Breward (Where Doc Martin’s son was born in The Old Inn), Blisland, Altarnun, Marhamchurch, plus too many others to mention. St Juliots Church (Boscastle) where Thomas Hardy (author of Far from the Madding Crowd) met his wife to be, Emma Gifford, a romance that led to the novel “A Pair of Blue Eyes”, and to some of his finest poetry. Morwenstow Church, north of Bude – Morwenstow is the one-time home of the eccentric vicar and poet Robert Stephen Hawker (1803–1875), the writer of Cornwall’s anthem Trelawney. Hawker is also credited with reviving the custom of Harvest Festivals. St Enodoc Church, Trebetherick: The church is situated in sand dunes east of Daymer Bay and Brea Hill on the River Camel estuary. Wind-driven sand has formed banks that are almost level with the roof on two sides. From the 16th century to the middle of the 19th century, the church was virtually buried by the dunes and was known locally as “Sinking Neddyor “Sinkininny Church”. For many years Trebetherick was home to Poet Laureate (1972-1984) Sir John Betjeman who is now buried at St. Enodoc Church.